Sayfullo Saipov, 29, was arrested in 2016 after he failed to appear in court for a minor traffic violation in St. Charles County, Missouri's, according to their Department of Corrections. 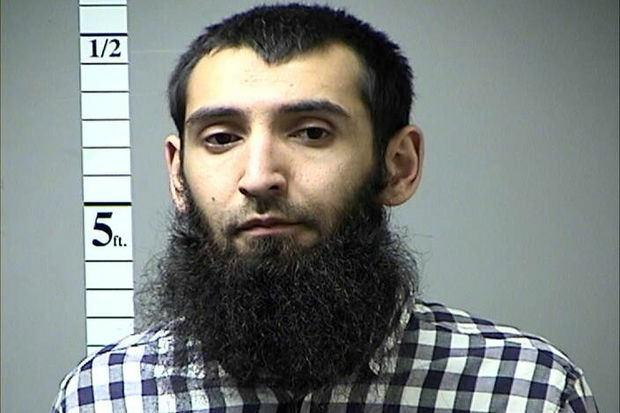 NEW YORK CITY — The terrorist truck driver who killed eight people and injured a dozen more by plowing through a West Side bike path Tuesday had been plotting the attack for several weeks and left handwritten notes in the vehicle showing support for the Islamic State, authorities said. Sayfullo Saipov, 29, who is originally from Uzbekistan but is a legal permanent resident of the United States, wrote the notes in Arabic saying "the Islamic state would endure forever," said John Miller, NYPD deputy commissioner of intelligence and counterterrorism, at a Wednesday press conference. Saipov, who worked as an Uber driver in New Jersey, had been planning the rampage for several weeks, though Miller declined to provide further details on how investigators determined that. While Saipov had never been under direct investigation by the FBI or NYPD, he is thought to have been linked to other people who were, Miller said. "It appears he will have some connectivity to some individuals who were the subjects of some investigations, though he himself was not," he said. Saipov moved to Ohio when he arrived in the United States in 2010, the New York Times reported, and he was married there in 2013 to Nozima Odilova, according to public records. He has two companies registered in his name there, including a commercial trucking company, records show. Before the attack — the worst since Sept. 11, 2001 — Saipov had several minor brushes with law enforcement for traffic violations, according to Governor Andrew Cuomo, who described the him as a "lone wolf" on CNN Wednesday. Last year, on Oct. 20, Saipov was arrested in St. Charles County, Missouri, after he missed a court date for an earlier traffic violation, according to Lieutenant Department of Corrections Michael McKee. It wasn't immediately clear why Saipov, who reportedly lived with his wife and two children in Paterson, N.J., was doing in Missouri last year, though he was also listed as having an address in Tampa, Florida, according to the arrest report. "[Investigators] are now conducting searches of his home and talking to friends and family," Miller said. Saipov had worked for Uber for more than six months and clocked more than 1,400 trips with the company in the New Jersey area, according to a spokeswoman. He also passed the company's background check, she added. Since the attack, he's been booted from the app and the company is cooperating with the FBI investigation, she said. While the investigation is still in its preliminary stages, authorities have been able to piece together a timeline of the deadly events as they unfolded. At 2:06 p.m. on Tuesday, Saipov rented a truck from a Home Depot in Passaic, N.J., and headed for Manhattan, officials said. Cameras recorded his truck exiting the George Washington Bridge at 2:43 p.m., officials said. Port Authority cameras near the Holland Tunnel recorded the truck at 3:04 p.m. entering the bike lane and "traveling at a high rate of speed," Miller said. Camera footage collected along the route showed that Saipov "appears to target bicycle riders an pedestrians" in the bike path next the southbound lane of West Street, Miller said. At 3:08 p.m., police got more than a dozen frantic 911 calls describing the attack. Police officer Ryan Nash, 28, and his partner, who had been responding to an earlier radio call near the scene, were flagged down and told there had been some kind of car crash near Stuyvesant High School. They arrived at the scene and found Saipov waving what looked to be real guns that later turned out to be a pellet gun and a paintball gun, Miller said. Nash fired his service weapon, shooting Saipov once in the stomach, officials said. Investigators found multiple knives in the truck along with the notes written in Arabic, Miller said. Twenty people were injured in the attack, with six declared dead at the scene and another two who died at nearby hospitals, officials said. Among the dead were five citizens of Argentina, one from Belgium, one from the West Village and one from New Milford, N.J., police said. Three people have been released from the hospital since the attack, while nine remain in area hospitals, according to FDNY Chief Daniel Nigro. Investigators interviewed Saipov while he was being treated at Bellevue Hospital, but officials declined to elaborate on what he said. He had not been formally charged as of Wednesday afternoon, officials said.